Aries and Taurus are close neighbors on the zodiac wheel but they possess opposite traits that will make one wonder if it is possible for a relationship to bloom between these two. Aries is the Fool in the Tarot, rushing in where angels fear to tread. Aries is a straightforward lover. They don’t generally play mind games, and you will know exactly where you stand when in a relationship with an Aries. They can sometimes be relatively aggressive and overbearing partners. Aries is all gung ho in love and is alive when pressing against resistance. An Aries is always in a rush and has to do everything at any given moment. On the other hand, a Taurus takes his/her own sweet time to fully analyze a situation, form a plan and then put all those plans into action. Aries is an initiator (fire sign) in life and love, while Taurus is here to bring things to take off the ground and to completion. Aries is a masculine, forward leaning sign and Taurus a feminine, receptive sign. There can be surprise love chemistry here, especially if genders are reversed, with an Aries female and Taurus male. Both are spring signs, passionate and creative.When these two signs fall for each other, Aries desire instant gratification in love, while Taurus takes things slowly. 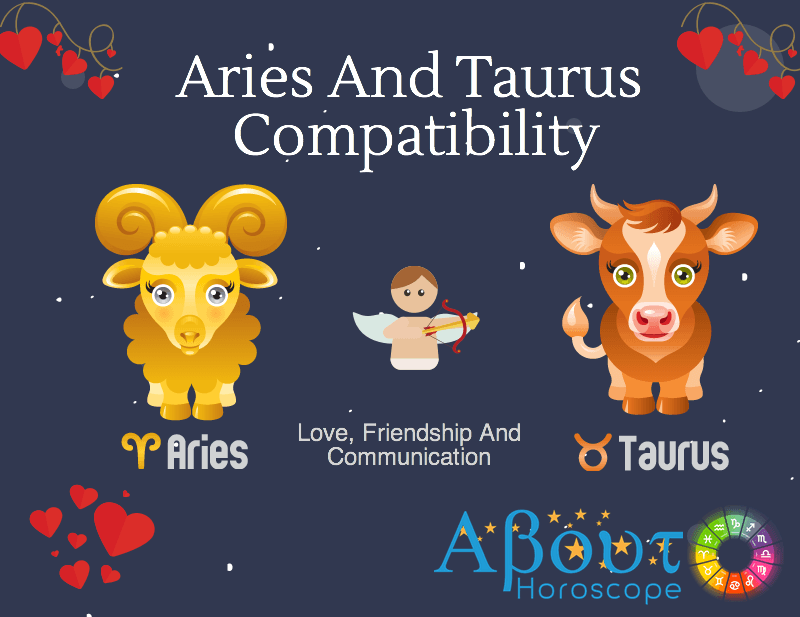 Aries and Taurus compatibility can be a great match. Taurus people love the outward nature of Aries and Aries people love the earthiness of Taurus. Sometimes these qualities that they like in each other, can turn to dislike as the relationship progresses. Having said that, this is a combination that is known to last. Taurus people are homebodies and very dependable. These are two aspects of Taurus that Aries really appreciates. The Aries individual is prone to “fall” every now and then, and his Taurus counterpart is bound to react with “I told you so” attitude. This can lead to some problems as far as the love compatibility. Each one of the duo has to respect the viewpoint of the other. If this balance is achieved, both the sun signs can beautifully complement each other. Taurus can give stability and dedication to the impulsiveness of an Aries and Aries can help in bringing some more excitement in the life of a quiet Taurus. Although, an Aries individual may sometimes become annoyed with the seriousness of a Taurean. The relationship may face a little time problem too. Aries likes to get things done yesterday, while Taurus always plans for the future. If they manage to understand each other’s temperament this relationship can go places. With a little compromise, the Aries and Taurus can make their yin-yang relationship work for them. In essence, the Aries – Taurus relationship will prove that not only do opposites attract, they can make a perfect couple.If there’s love glue, it’s a winning combo, high spirited and always new—like British pop royalty Victoria (Aries) and David (Taurus) Beckham. There is an instant connection between the Aries man and Taurus woman but there will be differences in opinion. They have to go past certain bumpy roads to make it as a couple. Aries are innocent and courageous but their thoughtlessness and impulsive reactions can make any Taurus outrageous who suffer from lack of reasoning. But at the same time Taurus are very patient creatures so the day can be saved for the couple. Aries man’s aggressive nature can be neutralized by Taurus woman’s calmness and sense of balance. Both the Aries and Taurus share the common traits of possessiveness and unmatchable loyalty. So to make this relationship work and last, there is a need to consistently show and communicate love and devotion. Being in love with the calm Taurus woman can give Aries man a sense of stability in his life. Moreover she looks around for the real man and will proudly gaze at him as the chief in all the aspects of life including the relationship. The peace-loving Taurus woman looks for harmony in her environment, but to him it may appear to be monotonous at times. But this can turn out to be a very passionate pairing, and you are likely to be the aggressor in this relationship. The relationship between Taurus and Aries is about balancing their differences. Aries needs excitement and adventure whereas Taurus needs security and stability. As long as both try to learn the art of compromise, their relationship will continue to grow and become stronger than ever.